The first person to suggest that Vermeer might have used some kind of optical aid to painting was the American artist and photographer Joseph Pennell, as long ago as 1891. Since then a series of art historians have pursued this idea including R H Wilenski, A Hyatt Mayor, Lawrence Gowing, Charles Seymour Jr, Daniel A Fink and Arthur Wheelock. 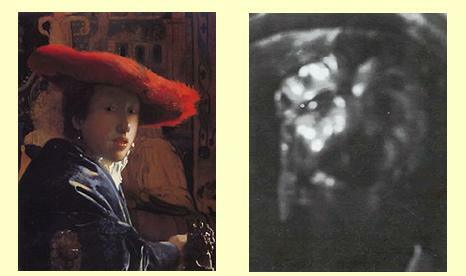 They have pointed to Vermeer's 'photographic perspective'; the fact that he depicts real objects such as wall-maps with extreme fidelity; and the fact that he seems to reproduce in paint some idiosyncrasies of optical images and 'out-of-focus' effects that would not be visible to the naked eye. Vermeer, 'Girl with a Red Hat' c.1660-61, oil on wood panel 23x18cm Photograph by Henry Beville to simulate out-of-focus effects in Vermeer's 'Girl with a Red Hat'.